Enjoy an ergonomic chair that comes with all of the adjustment features that allow you to personalize your seating experience. With the introduction of the Raynor Ergohuman Mesh Chair with Fabric Seat and Headrest to your workspace, you won't have to deal with subpar office seating again. Now the popular Raynor Ergohuman Mesh Chair with Leather Seat and Headrest LEM4ERG is available in customizable fabric and leather seat options, allowing you to match this popular chair to your decor. Tilt tension control ensures that the chair's recline rate adapts to your weight as you lean back, and tilt lock keeps it in place where you want it. Synchro-tilt lets the back recline in a preset ratio with the seat, and the chair's seat height adjustability ensures that it will fit a wide range of users, making it perfect for offices or workspaces with multiple users. A waterfall seat edge reduces pressure on the back of your knees and keeps your circulation flowing to your legs and feet, so you don't have to deal with feet that fall asleep while you're working. There's more supportive seating right around the corner (office) with the Ergohuman Mesh Chair with Fabric Seat and Headrest, and it's going to get you on a whole new level. Shopping for an office chair that features all of the adjustments to keep you comfy from head to toe? 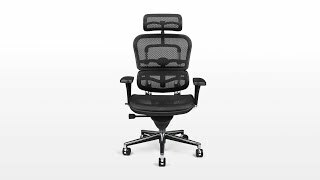 Try the Ergohuman Mesh Chair with Leather Seat and Headrest LEM4ERG or the Raynor Ergohuman Chair ME7ERG - Mesh with Headrest on for size. Seat height 18.5" - 22.2"
Choose from a wide variety of Fabrix upholstery options for the seat of your Raynor Ergohuman Mesh Chair. Your Ergohuman chair will come with a black mesh high back and a seat upholstered in knit fabric, leather, or vinyl. These chairs are considered by Raynor Eurotech to be custom covered chairs. Note: Custom chairs take 5-7 business days to manufacture before they will ship & are not returnable. Custom upholstered Raynor chairs (like those shown here) are nonreturnable. $705.00 List Price: $1,323.00* The list price is the same as the MSRP (Manufacturer's Suggested Retail Price). It may not necessarily be the price at which the product is sold.